Elephant Tower was located at the Golden Gate International Exposition in San Francisco in 1939-40. The Exposition was held on San Francisco's Treasure Island and two Elephant Towers stood as the gateway to the western entrance of the fair. This pewter replica is finished in antique gold and stands 3 inches tall. For more pics and info check out our blog. Excellent detail! Very well done World's Fair classic. 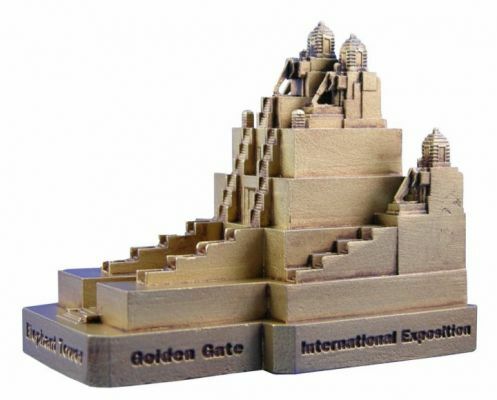 This one is a must have for every San Francisco or World's Fair collector. The Elephant Tower is the BEST reproduction I have in my collection, the details are mind blowing, stairs,spires and the Deco elephant trunks have amazing detail! I am very pleased and you now have a lifetime customer!!! !